U.N. Presses Case For Aid In Flood-Ravaged Pakistan More than 20 million people and at least one-fifth of the country's land mass have been affected by the worst flooding in the nation's recorded history, and there are fears that disease could contribute to a growing humanitarian crisis. 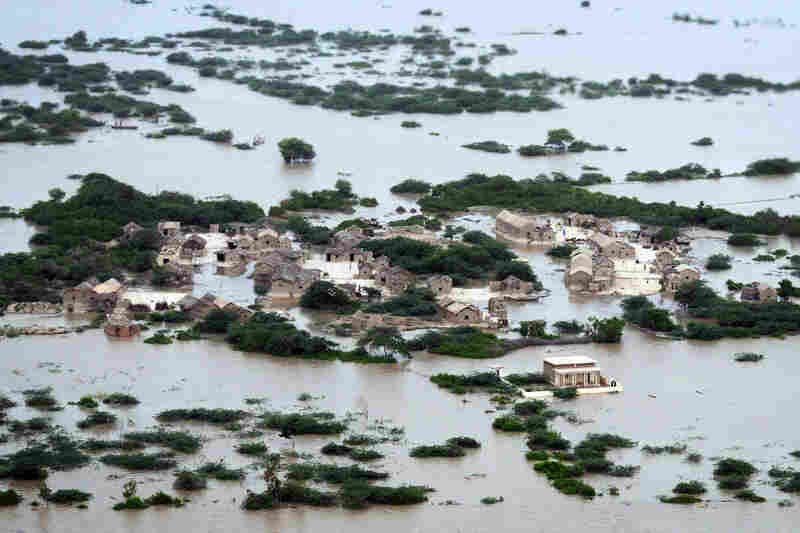 An aerial view shows the flooded Kharo Chan village in Pakistan's Sindh province on Aug. 25. The United Nations has described the widespread flooding in Pakistan as unprecedented, with more than one-third of the nation underwater. Officials say as many as 20 million people have been affected during Pakistan's worst flooding in 80 years. 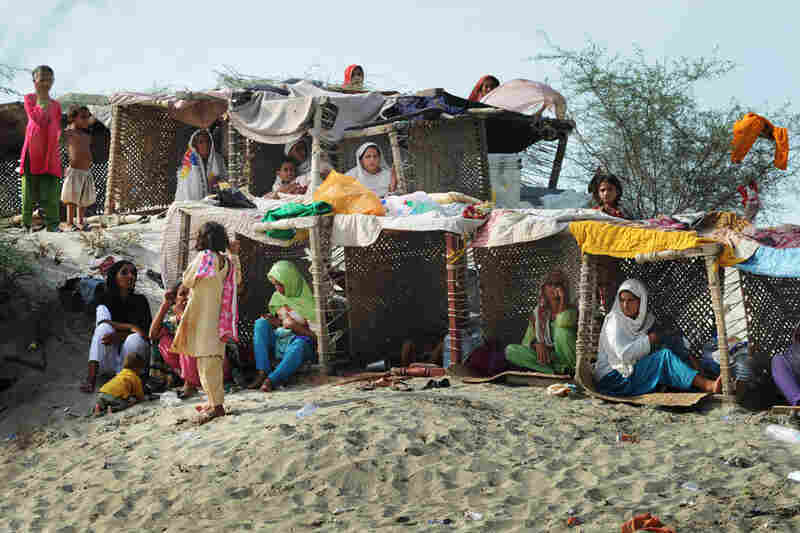 Pakistanis displaced by floods take shelter in temporary tents made with charpoys (bedsteads) near a makeshift camp in Baseera in Punjab province on Aug. 26. 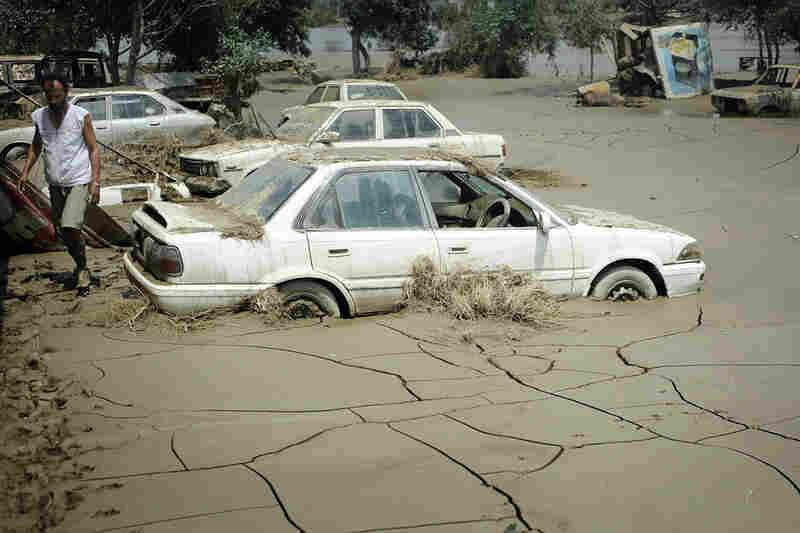 The United Nations warned that 800,000 people in desperate need of aid had been cut off by the deluge across the country and appealed for more helicopters to deliver supplies to those people reachable only by air. A boy and other displaced villagers plead for relief rations as a soldier waves a stick in an attempt to maintain order in the Sultan Colony army flood relief camp on Aug. 25. 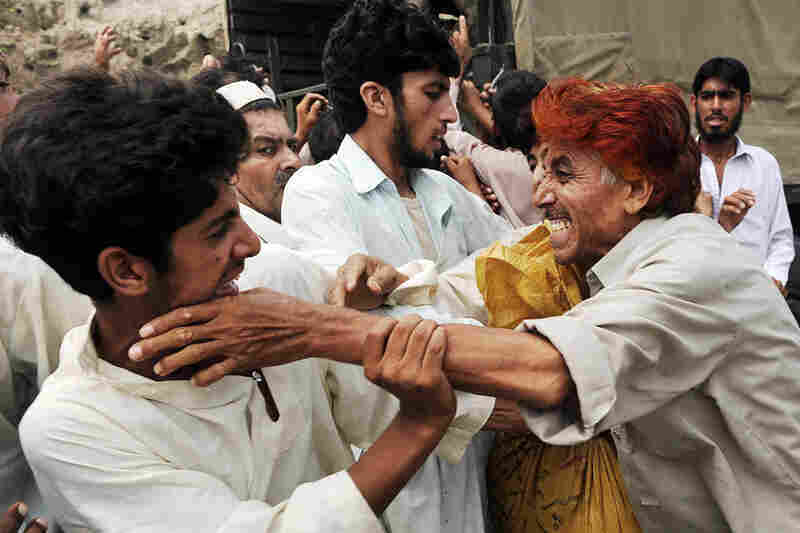 Pakistan's agricultural heartland has been devastated, with rice, corn and wheat crops destroyed by floods. 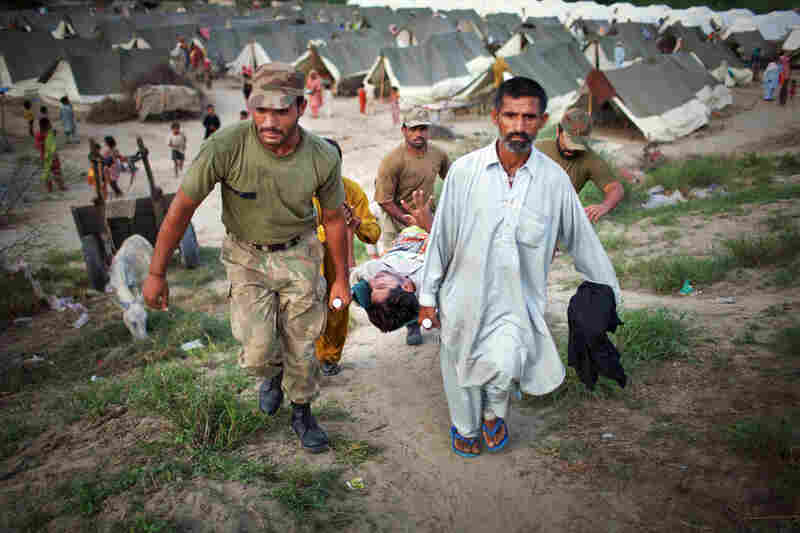 Suffering from high fever and spasms, Allah Detta is carried by soldiers as he is rushed to receive medical treatment in the Sultan Colony army flood relief camp. Military and aid organizations are struggling to cope with the scale of the disaster, in which more than 1,600 people have died and millions have been displaced. 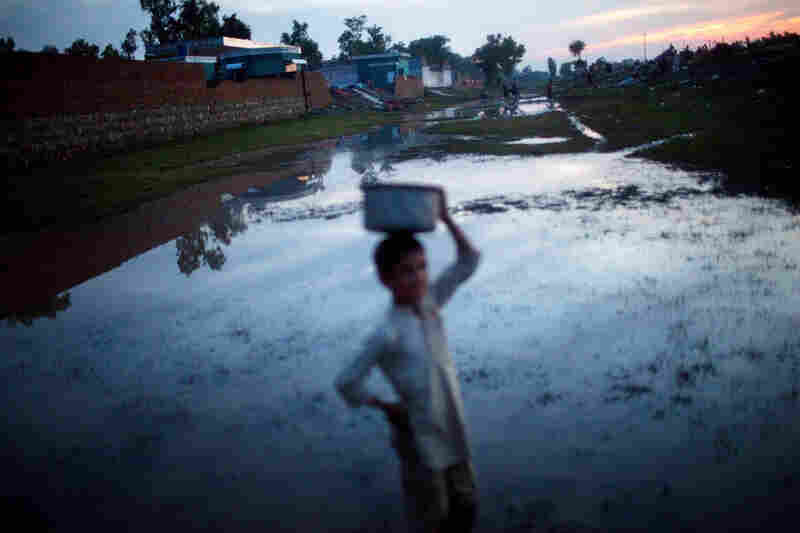 A boy carries water through a flooded yard in the village of Vasandawali in Punjab. The United Nations has appealed for $460 million to deal with the immediate aftermath of the floods, but has warned that billions will be required in the long term, with villages, businesses, crops and infrastructure wiped out. A man helps his wife cross a river in Kasbag Gujarat. 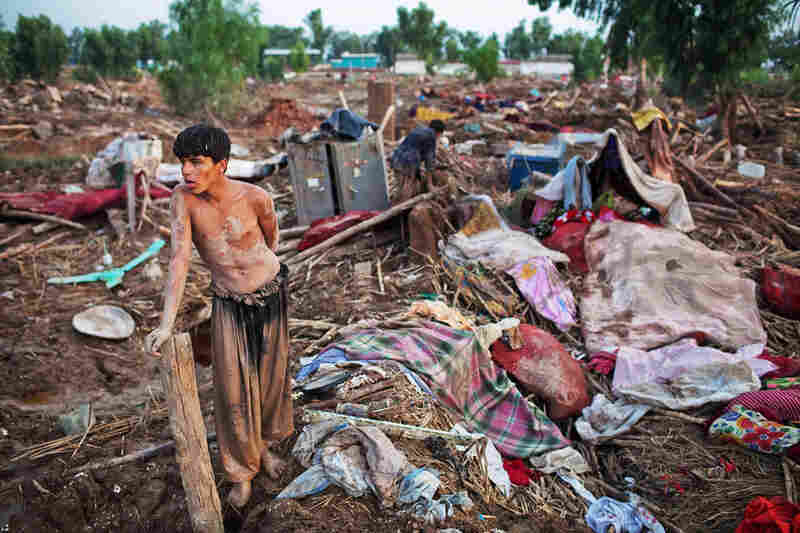 The United Nations estimates that 4.6 million people in Pakistan are still without shelter. 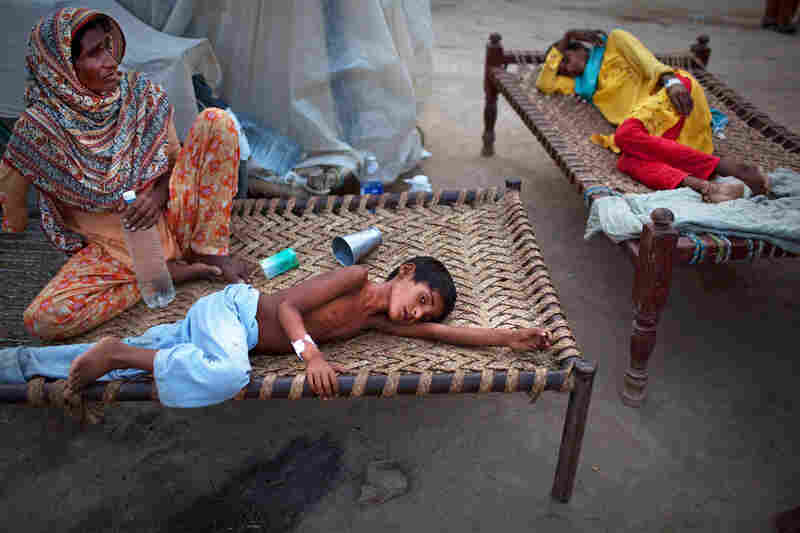 Yakub, 8, lies next to his mother Aug. 22 at a makeshift hospital in Muzaffargarh in Punjab, where he's receiving treatment for diarrhea. The U.N. warned that up to 3.5 million children are at risk from water-borne diseases and feared a "second wave" of deaths from disease after cholera was confirmed in some patients. Flood victims fight for relief bags distributed by soldiers in Nowshera on Aug. 20. U.N. agencies stepped up calls for donors to deliver on their pledges for Pakistan to prevent what U.N. chief Ban Ki-moon called a "slow-motion tsunami" from wreaking further catastrophe. Wind from a Pakistani navy helicopter blows furniture into the water as a man stands on top of his roof during an emergency aid distribution near Bachel in Sindh Province, southern Pakistan.The U.N. said the massive floods have eclipsed the scale of the devastating 2004 Indian Ocean tsunami. A flood survivor sleeps on a hammock Aug. 13 in Shah Jamal village. 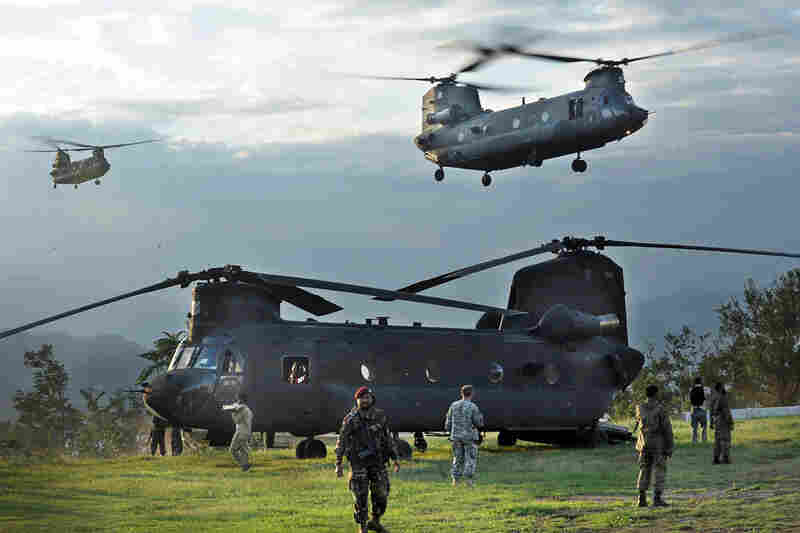 U.S. Chinook helicopters carrying flood survivors arrive Aug. 9 in Khwazakhela in the Swat Valley. 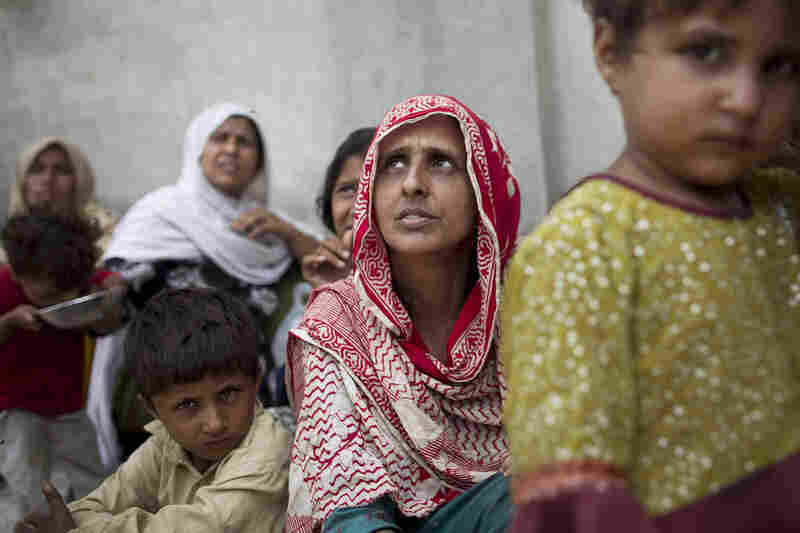 As anger mounts among survivors, the Pakistani government and U.N. officials have appealed for more urgent relief efforts. Dried mud surrounds cars Aug. 5 in Nowshera. 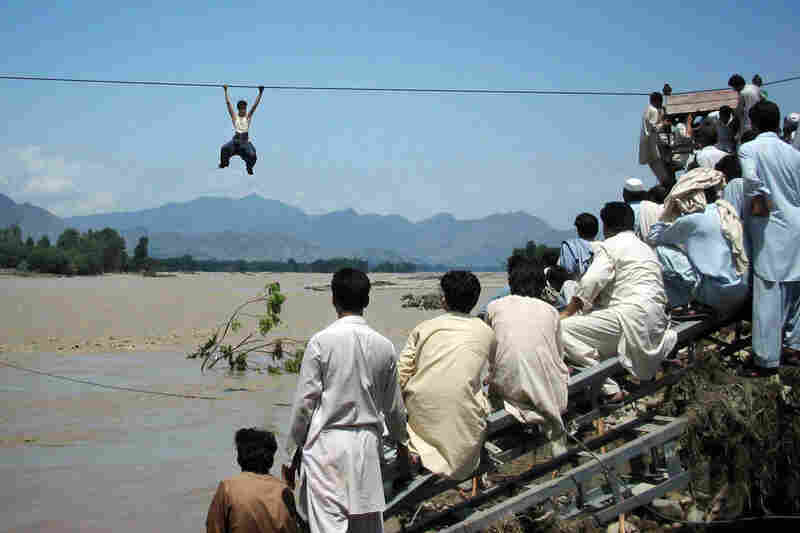 Onlookers perched on a damaged bridge watch a man cross a river by rope Aug. 3 in Swat Valley's Chakdara. 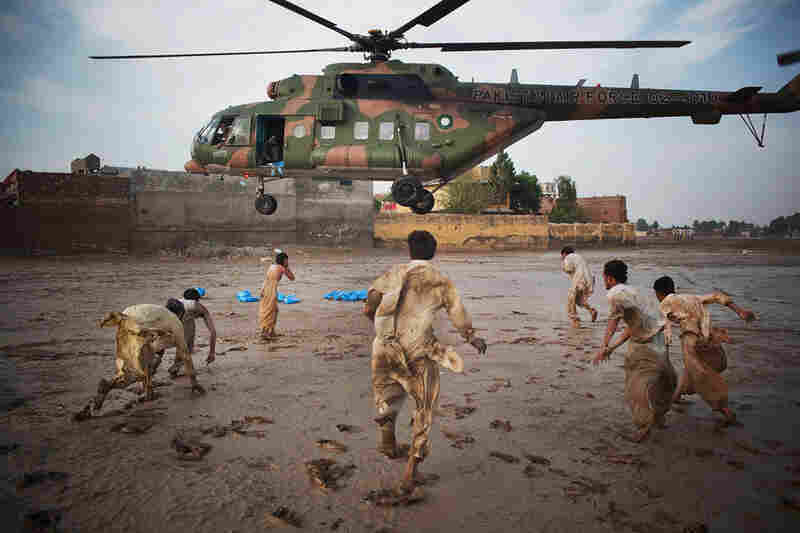 Residents grab water bottles dropped from a Pakistani air force helicopter Aug. 2 in Nowshera, where thousands were affected by the floods. Bibi Gul (center) sits with her family in a school transformed into a camp for displaced people on the outskirts of Nowshera. The monsoon swallowed up Gul's house and two of her children. With no news of her son and daughter days later, she is distraught. A boy takes a moment to rest after salvaging belongings from his destroyed home in Pabbi. A boy makes his way along a flooded pathway in Pabbi. The U.N. secretary-general is urging nations to step up humanitarian aid to flood-ravaged Pakistan, as residents -- angered by the government's inadequate response -- staged an angry protest Monday to demand relief deliveries be speeded up. 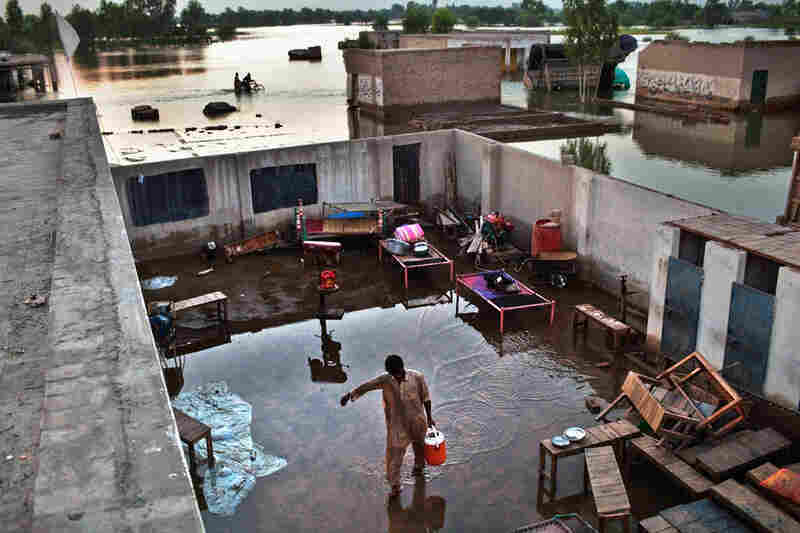 The worst flooding in Pakistan's recorded history began more than two weeks ago in the mountainous northwest and has spread throughout the country. Some 20 million people and at least one-fifth of the country's land mass have been affected. On Monday, hundreds of victims rolled stones and garbage onto a major highway near the hard-hit Sukkur area to complain that they were not getting adequate help. Protester Kalu Mangiani said government officials only came to hand out food when media were present. 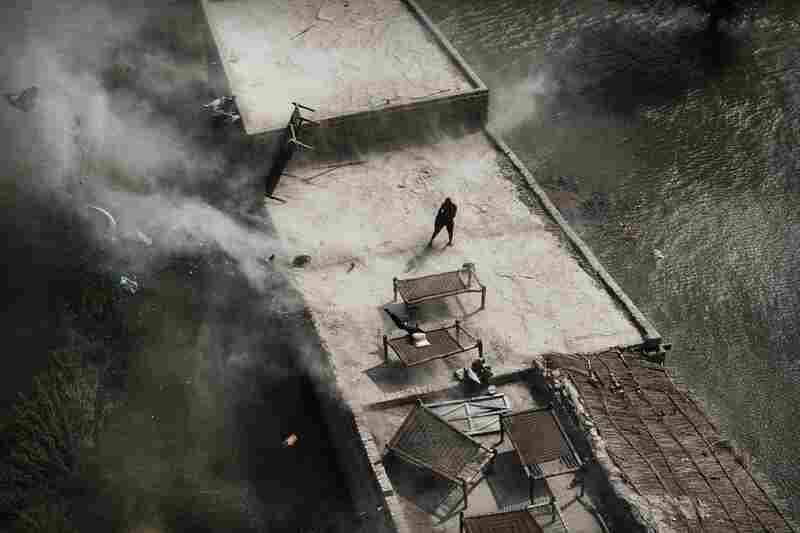 "They are throwing packets of food to us like we are dogs. They are making people fight for these packets," he said. 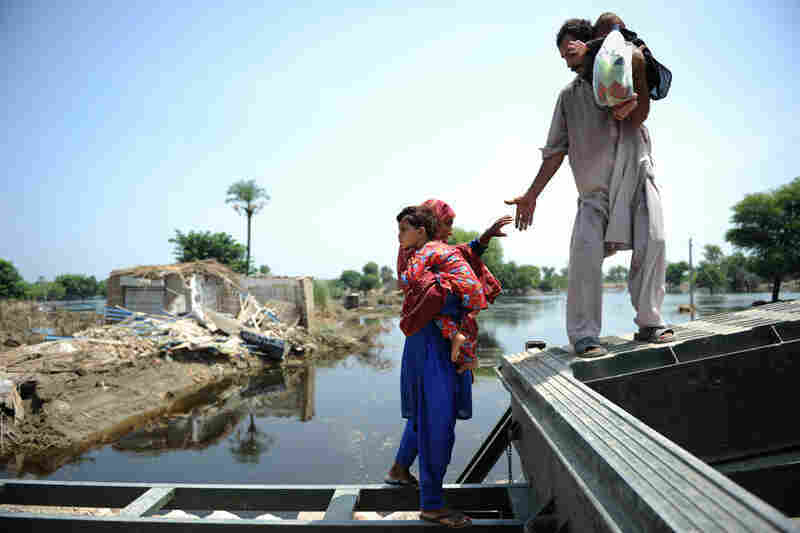 Across Pakistan, millions of people have fled the rising waters, and thousands remain cut off. Those who are stranded complain that rescue services are inadequate. NPR's Julie McCarthy, reporting from the village of Shahgar in the country's agricultural heartland of Punjab, spoke to Mohammad Nadeem, who runs relief to the region. 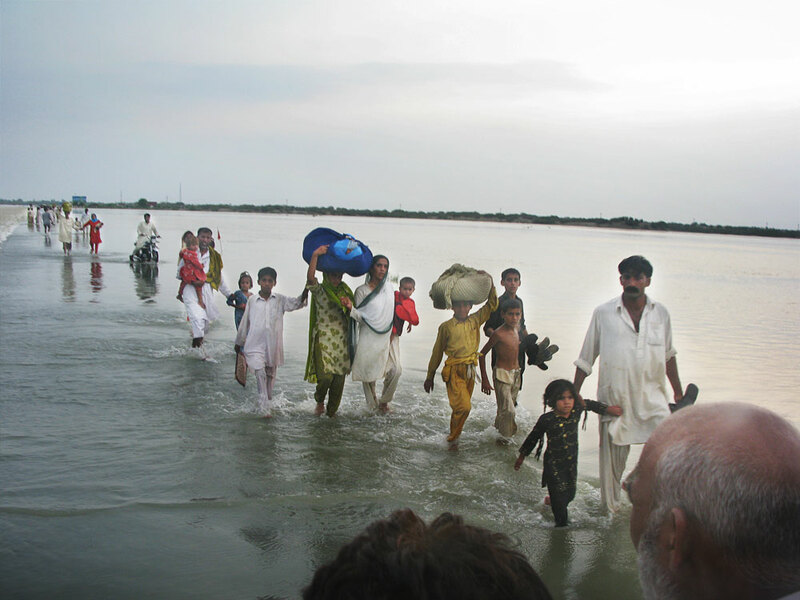 Families in Pakistan's southern Punjab province seek higher ground from the rising Indus River. Local relief officials say 2,000 people are stranded in the village of Shahgar without proper food, medicine and clean water. Residents complain that no government services have reached them. Nadeem said there has been no government presence in the area and that there were 2,000 or more people in the immediate area stranded by the flood waters. The army has filled the gap in some places where local governments have failed to provide assistance. 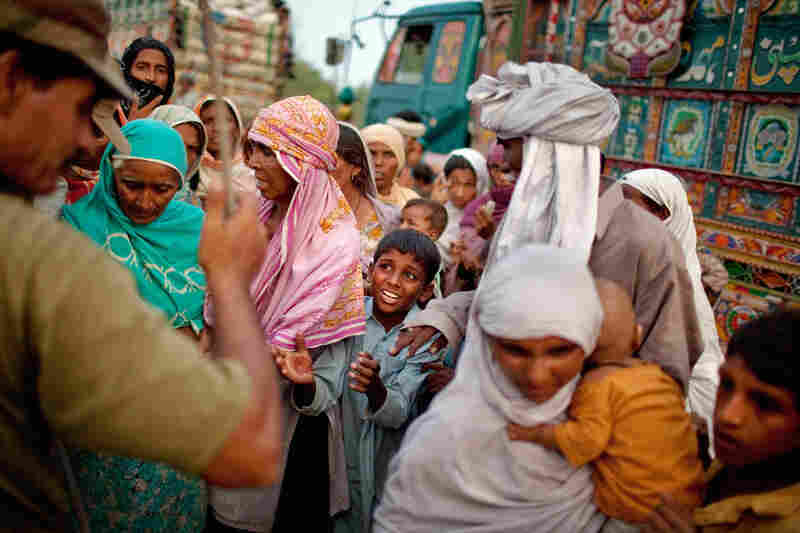 In southern Punjab, the military is sheltering about 60,000 people. One of those flooding victims, Mushahid Khurshid, has a family of eight living under a plastic tent strung together with a few pieces of clothing. He told NPR that his children were getting sick but that he was afraid to complain to the army. The U.N. has voiced fears that disease, overcrowding and unsanitary conditions in those relief camps could lead to a larger humanitarian crisis. While local charities and international agencies have helped hundreds of thousands of people with food, water, shelter and medical treatment, millions more have yet to receive anything. In an effort to draw attention to the disaster, U.N. chief Ban Ki-moon toured flooded areas of the country Sunday. "I'm here … to urge the world community to speed up their assistance to the Pakistani people," Ban told reporters. The U.N. World Food Program said Sunday that it's ability to assist the victims depends on getting the cash it needs to carry out its humanitarian operations. The WFP has urgently appealed to donors to respond rapidly with $150 million for aid. The U.N. agency said it has reached about 430,000 people in worst-hit areas with a one-month food ration. If weather permits, the agency said it hopes to reach 2 million people by Aug. 20. The International Monetary Fund has warned that the floods could dent economic growth and fuel inflation in the country.